If you want to shoot eye-catching images like a seascape with silky-smooth water, city streets absent of people, or light trails at dusk, a neutral density - or ND - filter is your friend. Such effects require a long exposure, but if you’re working in daylight, the necessary super-slow shutter speed is likely to overexpose your image. Shooting at your lens’s smallest aperture and your camera’s minimum sensor sensitive can help, but for a really long exposure, you’ll need to restrict the amount of light entering your lens by using an ND filter. These come in various density options, each defined by several numbering scales. For instance, ND 1.8 and ND64 are two ways to describe a filter that cuts light transmission by 6 f-stops, meaning you can use a shutter speed six stops slower than without the filter. This amount of light reduction is usually enough to smooth an image of moving water at dawn or dusk, but if you’re working in the midday sun, an ND 3.0/ND1000 filter is a better bet, as it’ll let you use a shutter speed 10 stops slower than normal. Here we’re testing round and square ND filters to see which can best match its quoted density rating, and we’ll reveal if any of these options reduce image sharpness or produce an unwanted colour cast. Round ND filters: A circular ND is convenient and resists light leaks. It’ll only fit one thread diameter, but stepping rings can adapt a larger filter to a smaller lens. 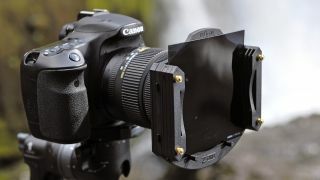 Square ND filters: You’ll need a holder and adaptor ring to use a square ND, but they can be used with multiple lenses. Just ensure light cant creep in behind the filter. The dark side: Eye-catching effects like silky-smooth daytime seascapes will require a very dense ND1000 (10-stop) filter to keep shutter speeds slow enough. Image quality: A neutral density filter should be just that - neutral. Colour casts can be easily corrected, but there’s no cure for a reduction in image sharpness. Extra effects: A square ND system opens up possibilities for stacking filters like a polariser or graduated ND filters for images with even more appeal. Cokin’s Nuances Extreme ND filters come in 6-stop and 10-stop densities, which is an ideal choice for long exposure photography. They can also be had in three sizes: P-size (84x100mm), Z-Pro (100x100mm), and X-Pro (130x130mm). We went for the Z-Pro option as this is the best balance of portability and versatile lens coverage. Their tempered mineral glass with rounded corners is said to be drop resistant, while a nano metallic alloy coating gives a more uniform density and better colour neutrality. And our testing proved this to be more than just marketing hyperbole. Both our 6-stop and 10-stop filter samples were joint best with the Lee IRND filters for colour accuracy. Sharpness at all points in the image frame was also flawless, and both filters exactly matched their f-stop light reduction ratings. Cokin’s EVO filter holder is an ideal match for Nuances Extreme filters. It’s beautifully made and features a very effective foam gasket to guard against light leaks during a long exposure, but it is expensive at £99/$180. The H&Y name may be new to the filter scene, but the company has actually been manufacturing filters for other brands for many years, and having recently made waves with its innovative magnetic filter frames, H&Y is now putting its name to the filters themselves. The K-series (100x100mm) square ND filters come in useful 6-stop and 10-stop densities. Both use multi-coated glass that avoids colour casts while also resisting moisture, fingerprints and scratches. Our testing revealed the 6-stop filter to be perfectly colour-accurate, while the 10-stop was just 1.2% off the mark, most likely due to it being fractionally less dense than its 10-stop rating. Both filters produced a flawless image sharpness result. The filters are even more appealing as they come with H&Y’s nifty magnetic filter frame which would cost £23/$35 separately. It makes the filters much easier to fit and means you never touch the glass. The only drawback is the foam gasket doesn’t quite seal the filter perfectly against light leakage. LEE Filters have long been the go-to brand for uncompromising filter quality, and its latest ProGlass IRND range is said to be the new benchmark in ND performance. Six density options are available, with a typical 2-stop to 10-stop range, but there’s also a super-dark 15-stop variant for extremely long exposures. The IRND name signifies that the filter coating blocks infrared and ultraviolet light for better image contrast, and LEE is claiming top notch exposure consistency and colour accuracy. We tested the 6-stop and 15-stop filters in the IRND line-up and both did indeed have absolutely no impact on colour accuracy in our testing. Image sharpness was also flawless, with both filters maintaining perfect centre, mid and corner-frame crispness. With such long exposures possible, LEE has come up with a companion app to help you calculate optimal exposure times. You’ll also need a suitable 100mm filter holder to use IRND filters, with the obvious choice being the newly introduced £83 LEE100 holder. Finally, a lens adaptor ring is required to attach the holder to your chosen lens. Hoya’s Pro ND range of circular filters comes in ND4 to ND1000 variants for a 2-stop to 10-stop shutter speed reduction. Most common filter thread diameters are catered for by the 49mm-82mm size range, though the frame is slightly deeper than the B+W and Marumi circular filters, which could introduce minor vignetting when shooting with a very wide lens. As you’d expect, Hoya is keen to promote the ProND’s colour neutrality and exposure accuracy, with features like a Metallic ACCU-ND coating on both sides of the glass. And whatever this really is, it does work. We tested the ND64 (6-stop) and ND1000 (10-stop) ProND versions and found them to be the only round filters on test to have no negative impact on image sharpness at any point in the frame. Colour accuracy was a shade off the standard set by the best square filters, but a 0.5% deviation from the ND64 and a 1.3% difference from the ND1000 won’t be visible in real-world shooting. A 77mm ProND 1000 compares well with similar rival filters on price, making it reasonable value for its decent image quality. ND filters produce the most dramatic results when using very long exposures, so Marumi’s DHG Super range only contains high-density 9-stop and 10-stop options. Both are round screw-in-type filters, available in all common diameters from 49mm through to 82mm. We’re quoting prices for the 10-stop (ND1000) filter, but the ND500 pricing is similar. The filter’s shallow frame depth helps avoid vignetting when shooting with an ultrawide lens, and its satin finish reduces reflections. The filter glass also has a scratch-resistant coating. Sadly, neither our Super ND500 or ND1000 sample filters managed a flawless performance in our testing. The ND500 produced a 2.5% colour shift from optimal, and the ND1000’s colour deviation was worse at 4%. Image sharpness was also negatively affected. Both filters maintained perfect centre-frame sharpness, but reduced mid-frame sharpness by a noticeable 20% in the case of the ND500, while the ND1000 produced a 24% drop. Sharpness in the corners of frame wasn’t quite so badly affected, but both filters still gave the worst results of the group. Screw-in filters may not quite have the kudos of a square or rectangular filter system, but B+W’s round XS-Pro filters certainly aren’t short on features. Their MRC Nano (Multi-Resistant Coating) helps shed dirt and water, and we found it does indeed do a good job of beading away rain drops. Further coatings reduce reflections, while SCHOTT glass (drinks, anyone?) increases optical clarity and colour fidelity. Thread diameters range from just 30.5mm all the way up to 95mm, and you can have 2, 3, 6 or 10-stop densities. Whichever option you go for, you get an exceptionally shallow frame depth that makes these filters great for ultra-wide photography. However, our samples weren’t quite so great in our image quality tests. The 3-stop version produced excellent results in our colour accuracy and sharpness tests, but the 6-stop and 10-stop filters introduced some issues. Both our samples were ⅓-stop too dark, requiring exposure compensation to maintain accurate colour. Mid-frame and corner sharpness also dropped 5% with the 6-stop filter fitted, and by 20% with the 10-stop filter. Not great considering the hefty price commanded by the larger-diameter filters. We lab tested each filter by attaching it to a Sigma 50mm f1.4 EX DG HSM lens mounted to a Canon 5D Mark III body. Images of specialist charts designed to test lens sharpness and colour accuracy were then captured using a shutter speed reduction equivalent to the f/stop density rating of the filter being tested. The resulting images were then processed using Imatest Master analysis software to determine the impact each filter has on sharpness and colour accuracy. The percentage differences in sharpness and colour deviation from a non-filtered control image are displayed in the graphs below. This graph shows the percentage impact each filter has on image sharpness. The ideal score is 100%. Almost all the filters managed this when testing centre-frame sharpness, but the higher-density B+W filters, and both Marumi filters on test, had a significant impact on sharpness in the mid-frame and corner-frame image regions. A score of zero on this graph indicates ideal colour unaffected by the filter, with longer bars showing a more obvious colour cast. It's worth noting that inaccurate filter density ratings will impact on the score in this test. So for filters that produced an over or underexposed image when we reduced the camera's shutter speed by the same number of f/stops as the filter's density rating, we also used a slightly slower or faster shutter speed to counteract the issue, indicated by asterisks around the filter name on the graph. In the case of the Marumi filters, both were accurate to their density ratings, so the poor results here are due to colour casts. Finally, the LEE 15-stop filter initially produced a poor result, but came good when using a further 1/3-stop longer exposure. However, as we needed to use a combination of shutter speed reduction, a larger lens aperture, and a higher ISO sensitivity to compensate for the huge 15-stop light reduction, we're giving the filter the benefit of the doubt and assuming it to be accurate to its 15-stop rating.